The Temple Terrace Police Department had no way to track entry into secured areas of their department, and they needed to improve security. The existing mechanical locks had been in place since the building’s construction, and there was no accountability for keys distributed over the years. According to Deputy Chief Patricia Powers, “The most important access we needed to track was the entry into the evidence/property room. 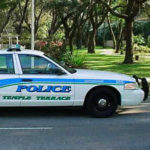 We also needed to have locks on the exterior doors and elevator that could not be tampered with to limit unauthorized after-hours access to the offices and storage areas.” Temple Terrace Police Department needed a complete security solution that was also economical. In November of 2003, Deputy Chief Powers began working with Practical Products Group, a CyberLock reseller, on building security. The CyberLock access control system was suggested as a solution to their problems. After further research, Temple Terrace Police Department decided to replace their mechanical locks with CyberLock. The cylinders are now installed in the holding facility, evidence room, exterior doors, offices, storage rooms, and elevator switches. CyberLock cylinders do not require any wiring or battery at the lock. The cylinders are powered by the battery within the key. This was a decisive factor for the police department’s implementation of CyberLock because it meant they could install a complete access control system without the expensive costs of hard wiring. Deputy Chief Powers said that before CyberLock, officers carried a large ring full of keys that were not only noisy and cumbersome, but also expensive to replace if lost or dropped while running after a suspect. Now, officers carry a single CyberKey for access throughout the department, and security is not threatened due to the “Lost Key” and key expiration functions provided by the software. Temple Terrace Police Department now has the ability to view reports that show who accessed specific doors and areas, providing them with a high level of security at their facility. The system is already expanding, with padlocks on the impound shed and new installations at the fire department and city hall. Click here to learn more about CyberLock applications for the Public Safety industry. "The most important access we needed to track was the entry into the evidence/property room."